Menulog delivers for Sacred Fig so you'll be able to track your courier on a map. Homemade pastry filled with spiced potatoes, cashews, green peas and herbs. Finely sliced onion and herbs dipped in chickpea flour and deep fried till golden and crispy. Mashed potato cake flavoured with fresh herbs and spices. Fresh cauliflower florets dipped in spiced chickpea flour. Crispy semolina puffs served with spiced mashed potatoes and beans and special coriander water. Fresh mushrooms marinated in paprika, garlic, black pepper and other spices, tandoor-cooked. Tandoor-roasted chicken marinated overnight in yogurt and house spices. Basa fish fillets marinated in garlic, herbs and spices. Fresh tiger prawns marinated in specially selected spices. Juicy salmon fillets in lime and cumin marinade. Lamb cutlets marinated in special blend of spices. 5 pieces served with rice and raita. Nepalese dumplings filled with special marination of chicken, fresh garlic and ginger, green herbs and specially selected spices, served with a special tomato chutney. 12 pieces served with special chicken broth. Indian style spiced lamb sausage, tandoor-cooked. Chicken thigh fillets marinated in special blend of spices and cooked in tandoor. Fish cutlets coated in special marination of chickpea flour with select spices. Pan-seared chicken kebabs smeared with delicately spiced avocado mash. Tandoor roasted boneless fillets in a salad-like marination of olive oil, roasted cumin seeds, fresh garlic, fresh ginger, Spanish onions and lime juice. Mains served with rice and raita. Slow cooked diced lamb sautéed in olive oil with roasted cumin seeds, fresh garlic and ginger, Spanish onions, drizzled with lime juice. Mains served with rice and raita. Slow cooked lentils tempered with cumin seeds, onion and garlic. Slow cooked lentils tempered with cumin seeds, onion, garlic, capsicum and mushrooms. Slow cooked mixed lentils finished with tomato-based creamy sauce. Simple traditional curry; spinach and potatoes. Potatoes and baby peas in spiced creamy tomato gravy finished with lemon juice. Seasonal vegetables cooked in an onion-tomato-based sauce. Seasonal vegetables cooked in deliciously creamy sauce with cashews and a delicately balanced blend of spices. Tempting eggplant curry, coated with thick gravy, teeming with spices. Potato and paneer dumplings simmered in creamy sauce. Okra stir-fried with potatoes, ginger, garlic and spices. Spinach and cottage cheese in creamy sauce. Cottage cheese and green peas with creamy tomatoes. Sliced mushroom tempered with garlic and cumin, cooked in spinach puree. Succulent meat cooked in rich gravy with curry leaves and roasted coconut. Tender meat with sautéed mushrooms, fresh ginger, tomatoes and spring onion. Meat and potatoes based in hot curry sauce. Tender meat cooked in special spinach-based sauce. Tender meat cooked in deliciously creamy sauce with cashews and a delicately balanced blend of authentic spices. Chicken stewed in onion- and tomato-based sauce, flavoured with ginger, garlic, tomato puree and spices. Wonderful blend of chicken curry and spinach. Tandoor roasted chicken cubes in tomato-butter sauce. Chunks of roasted marinated chicken in spiced gravy. Chicken and potatoes based in hot curry sauce. Chicken and mushrooms tossed with onion and capsicum. Chicken cooked in deliciously creamy sauce with cashews and a delicately balanced blend of authentic spices. Succulent chicken in rich gravy with curry leaves and roasted coconut. Chef’s special Nepalese style chicken stir-fry. Must-try chicken dish cooked with capsicum and pickles. 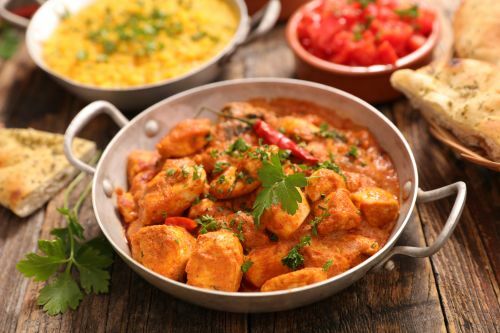 Chicken cooked in house-made Balti sauce, made of yogurt and special selection of spices. Fish fillets simmered in carefully crafted blend of coconut milk, cream, spices and roasted mustard seeds. Fish fillets based in special dry masala, made of onion, tomatoes and capsicum. Tiger prawns simmered in coconut milk and cream and flavoured with spices. Must-try tiger prawns cooked in special sauce. Basmati rice cooked with mild spices, cream and peas. Our biryani is a specially-made spicy seasoned rice tossed with either vegetables or meat. Cashews, select spices and fresh herbs make it undeniably flavoursome. Sweet and spicy mango chutney. Spicy, more tangy and pickled vegetables. Sweet yogurt-based, mixed with carrots, cucumber and spices. Soft, leavened bread made with plain flour, coated with ghee. Naan stuffed with minced chicken and roasted spices. Cheese and garlic flavoured naan. Naan stuffed with mushrooms, potatoes and herbs. Sweet naan with nuts and raisins. Wholemeal, layered and flaky bread. Wholemeal paratha stuffed with herbs and spiced potatoes.